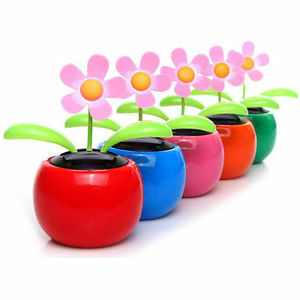 Solar Dancing Flower Toy: Meet the Flip Flap Flower! September 7, 2010 December 26, 2017 - 3 Comments. The Flip Flap dancing daisy: you have to have one, simply because it’s completely useless, and that makes it so cute! (I like useless things, I admit…) And someone named them ‘Flip Flaps’. Imagine a board meeting: “Yes boss, we’ve spend several thousands on this solar dancing flower and the marketing department came with this: Flip Flaps!“. Imagine: You are working in a tiny cubicle with no room for live plants. Or instead of a green thumb, yours happens to be… well, not green. But you desperately really, really, really want something green in your work space, then I suppose that you are the consumer for whom this solar-powered-plant-with-moving-leaves-called-a-Flip-Flap was created! Ah, well, the Flip Flap flower in the video is not on some desk, but in front of a window. Seems logical because flowers need sunlight. And this solar powered version is of course not an exception. Though it runs on light bulbs too! Who makes the Flip Flap flower? TOMY from Japan (where it has a big cult following…) distribute this solar toy in the UK, but according to this Flip Flap article on Wikipedia it is originally patented by the ‘Shenzhen Longgang Pinghu‘ company from China. There are lots of ‘fake’ Flip Flap flowers on the market so if you want to make sure you have the original and authentic Tomy Flip Flap flower, look for the Tomy logo. Also the text on the box of the original consists of almost only Japanese words and characters. Besides, the leaves are much more darker than the fake ones. This video explains how the flip flap flower actually work. It works with a magnet and a small current, generated by the solar panel. Is your special solar dancing flower friend broken? If it’s not working as it should, then probably the magnet is displaced or knocked during shipping or after it fell from the your table. Don’t despair! Geek Girl explains on her blog how to fix a flip flap flower after it fell on the floor, but you can also take a look on this page where I explain how to fix solar lights. You can buy the Flip Flap Flower on Amazon or eBay. Where can I buy it in Jhb, Gauteng, RSA ? I don’t know… you can try at electronic gadget shops which sell solar powered toys. I have one of those. My daughter gave me the pink one (you should hear my colleges in the office).. Sounds strange but I really like to look at it and it’s indeed relaxing.